We see audiovisuals routinely in darkened, air-conditioned room. The Ark invites viewers to wander a botanical setting, plant life bathed in hard-contrast light and shadowjo, architectural forms animated through the vegetation. Set in Mexico’s Ethnobotanical Garden of Oaxaca, multiple works from visual label ANTIVJ create an open-ended environment of image and sound. 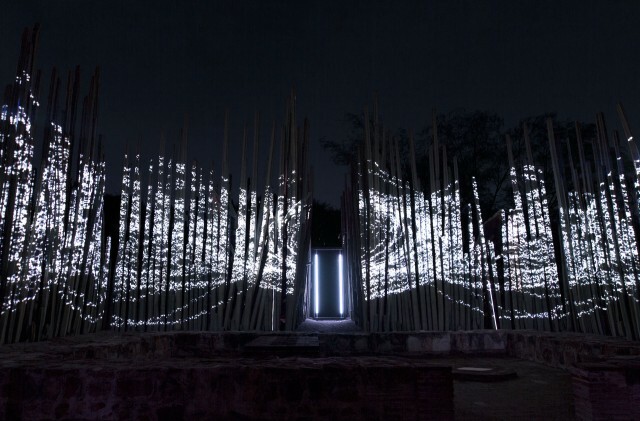 The Ark is a site­specific audiovisual installation, and also the second step of a journey that begins with Onion Skin, an installation by Olivier Ratsi and Thomas Vaquié. The Ark was written as a path through Oaxaca’s Garden, and was divided in three different parts. A first trail was leading, and progressively immersing, the walkers into the core of the piece. Shapes of light and whispering sounds were slowly drawing the way to the main scene. The very setting was responding to the inherent nature of the place. 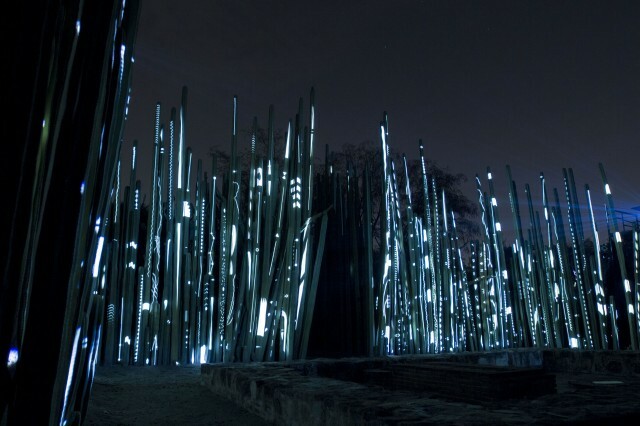 Its architecture drawn by cacti which separate the space in two involuntary chambers of contemplation, allowed the visitors to see the installation from different angles. The idea to play with a multi­sided space became a thread in the narrative construction of the piece. The particularity of the location and its direct influence on the piece itself, create a deep connection between The Ark and the ethnobotanical garden of Oaxaca, acting as a true contextual installation. Working with nature and using plants as a visual canvas, gave us the idea to use their presence not only as a projection surface but also as living beings embodying at some point an individual presence. Seeing nature as a whole, consisting of multiple living entities organized under their own rules, obviously led the writing of the piece and its different phases. 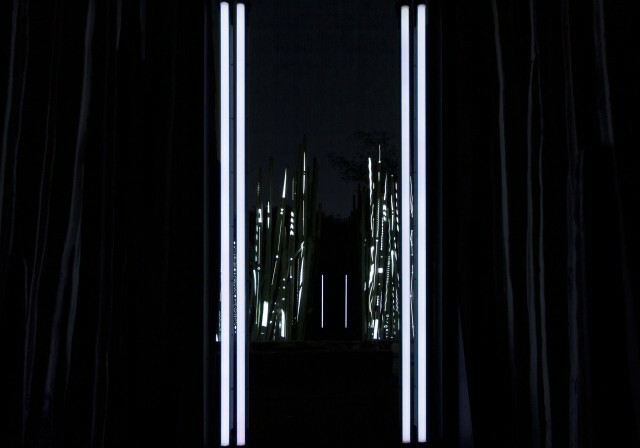 Set as the main characters of the installation, the cacti were at times either taking independent roles or rather weaving together the whole visual mass by interlacing their own strands of light to create a third­part living reality which naturally took its place in the context. But the Ark doesn’t actually consist of an attempt to reach a pristine symbiosis between nature and technology. The idea was more to create a peculiar encounter between them, where, when possible, the technical means implemented could be forgotten, to leave space to the spectacle of their confrontation. Therefore, and perhaps to enhance this face­off, Romain designed an immaculate white parallelepiped structure that could be seen from the very last part of the trail. A pure and foreign matter that finally found its place as the conductor of this unpredicted collision. As for ANTIVJ, they have some terrific-sounding projects ahead. ANTIVJ is for many people associated with the name of co-founder Joanie Lemercier, but Joanie and ANTIVJ announced last month that they were parting ways. (The announcement itself was mostly a formality; Joanie’s last ANTIVJ project was 2010.) Joanie’s career has tended more to solo artist working on his own projects (those also, of course, getting loads of press here), and ANTIVJ has grown in its own direction. From the original group of four – Yannick Jacquet, Joanie Lemercier, Olivier Ratsi, and Romain Tardy – others have joined. Thomas Vaquié (music), Simon Geilfus (visual artist/creative coder), and Nicolas Boritch have all joined the crew, with Boritch managing the operation. – a record label releasing physical objects, such as Thomas Vaquié’s first album..